Founded in 1990 by Gail and Richard Pope, BrightHaven is an animal rescue, hospice and holistic education center. 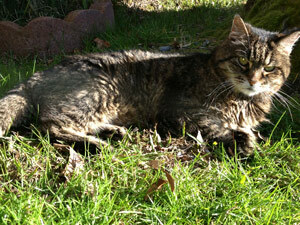 Our primary focus: senior, disabled & chronically ill animals. By becoming a part of our network of valued supporters, you will receive emails regarding animals needing rescue, updates on those we have saved and information on educational workshops and other resources. In 2010 BrightHaven Rescue was formed with the goal of saving shelter animals most at risk for euthanasia due to their age or illness. We have has been very successful in finding both foster and forever homes for hundreds of abandoned animals in our local communities. We specialize in medical rehabilitation, which makes us unique. Since 1990, BrightHaven evolved to become a unique hospice center serving over 600 senior, chronically ill and disabled animals, a population which has an overwhelming need to find love and care in our society and most especially during the last phase of their lives. BrightHaven hospice care is modeled on human hospice care where we pledge to provide a painless, loving and peaceful journey followed by a painless, loving, peaceful & natural death. When we share what we’ve learned about animal hospice and holistic healthcare with the community through our education program, we truly believe we are a small part of helping our planet become a better place in which we can all live peaceably together. In the The BrightHaven Guide to Animal Hospice online self-paced series, BrightHaven Co-Founder’s Gail and Richard Pope are thrilled to share what they’ve learned since 1990 by listening to their wise animal teachers. It’s all about living well through the last breath! Gail has an international consultation practice and is contacted by many vets and animal caregivers regarding BrightHaven’s natural methods and protocols for animal care and hospice. Book a consultation with her by sending an email to consultations@brighthaven.org. Gail has written five books on holistic healthcare and animal hospice that are available on www.amazon.com. BrightHaven was founded in 1990 by Richard and Gail Pope, who since then have dedicated their lives to giving the gift of tomorrow to animals in need, particularly those who are senior, disabled and chronically ill. In July 2013, BrightHaven Co-Founders Gail and Richard Pope received the prestigious Jefferson Award for Public Service, in acknowledgement of their devoted service to this extremely vulnerable population of beings. From 1990 until 2018, unwanted, old, disabled and chronically ill animals found love, acceptance, family and a safe haven at BrightHaven’s sanctuary. We saved over 1,000 senior, disabled and chronically ill animals by giving them the gift of a loving and dignified home for life—however long or short that life may be. BrightHaven has also rescued and helped thousands more animals through its various programs. In 2018, we sold our Northern California sanctuary property and closed the sanctuary due to financial sustainability concerns. We felt this was the best decision to enable our organization to build today for a brighter tomorrow for animals. We are delighted to report that all of our sanctuary animals have settled into wonderful and loving new homes. BrightHaven’s Gail Pope is providing our existing critically ill and hospice animals with specialized holistic hospice care in her own home. With continued funding, the BrightHaven legacy will remain and continue into the future as a shining beacon of hope and help for animals and their human companions.